We asked, you opened your veins. The numbers are in, and thanks to the participation of Douglas College students and employees, we donated 224 pints of blood to the Canadian Blood Services' Partners for Life program last year. That's more than double of what we pledged! 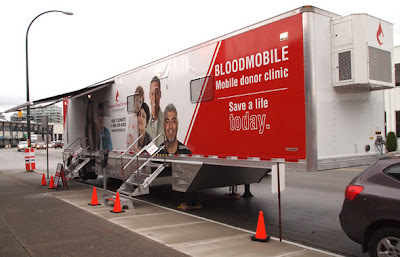 The next time the Bloodmobile heads to the New West Campus is Thursday, Feb. 7. Book your appointment at 1-888-2DONATE. Walk-ins will be accommodated wherever possible. The sign-in desk will be on the 4th floor, near the Royal Avenue exit/Studio Theatre, and the Bloodmobile itself will be up on Royal near Seventh Avenue. We encourage you to go online to register as a Douglas College member in the Partners for Life "team," so that whenever and wherever you donate, your pints count towards our group total.